Steven (Chicagoland, United States) on 9 March 2012 in Architecture and Portfolio. The Thomas Jefferson Memorial is a presidential memorial in Washington, D.C. that is dedicated to Thomas Jefferson, an American Founding Father and the third President of the United States. The neoclassical building was designed by John Russell Pope. It was built by Philadelphia contractor John McShain. Construction began in 1939, with completion in 1943. The bronze statue of Jefferson inside the memorial was added in 1947. 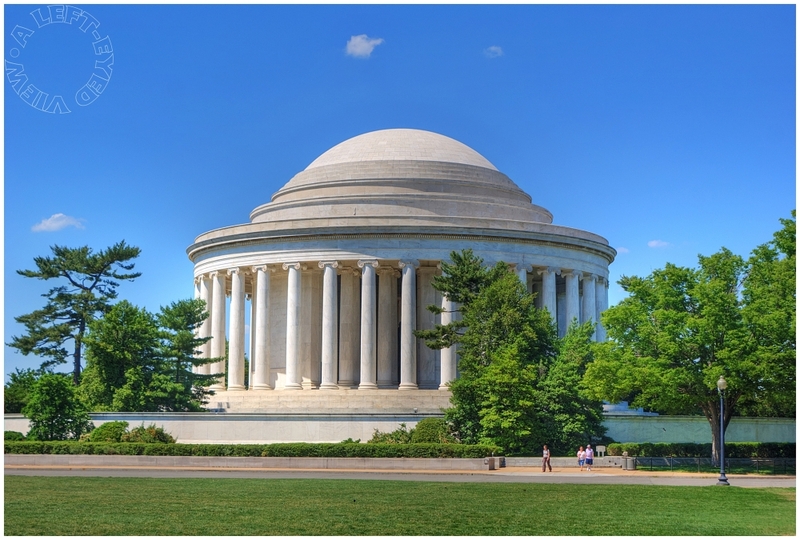 The Jefferson Memorial is managed by the National Park Service under its National Mall and Memorial Parks division. Composed of circular marble steps, a portico, a circular colonnade of Ionic order columns, and a shallow dome, the building is open to the elements. John Russell Pope made references to the Roman Pantheon and Jefferson's own residence for the Rotunda at the University of Virginia. It is situated in West Potomac Park, on the shore of the Tidal Basin of the Potomac River. The Jefferson Memorial, and the White House located directly north, form one of the main anchor points in the area of the National Mall in Washington, D.C. Very nice shot. That blue sky makes the Memorial pop out. A very clean shot Steve, lovely clarity. A marvelous capture of this beautiful Memorial. Excellent clarity and beautiful light and colours. Well done !! a pristine image of this marvellous memorial! i found it just as impressive inside, with t.j.'s huge statue dominating the hall, and some of his wise words imprinted along the frieze !! Really beautiful shot of the memorial, Steven - the colors are marvelous. I had no idea this was so larege. A very effective and beautiful photo of this important building. Wonderful point of view and the circular dome with its classical columns makes a very striking memorial. Very beautiful ! Superb framing ! a very perfect image of this structure - and the exposure is spot on!! perfect HDR work - gorgeous! This building is really extraordinary. I love its "smoothy" dome. This is amazing, this building, especially with the people showing the massive scale. I doubt if they ever will build such a building anymore for any person, living or dead ! by Pope, he was truly a classicist ! A very beautiful photo...I like the lush foliage, the people walking about and the crystal blue sky really brings out the memorial. Amazing colors, wonderful photo !!! Fantastic image! This is probably my most favorite memorial. Wonderfully composed photo - it looks like a postcard! A fabulous shot, and the people and a sense of scale to the monument.